BPT’s Resident Roller Girl Re-Caps the Derby World Cup in Toronto! 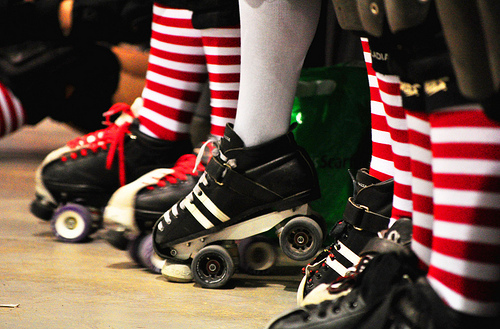 On December 1st through 3rd, Blood & Thunder Magazine hosted the Roller Derby World Cup. I was lucky enough to be able to attend and serve as an ambassador for Brown Paper Tickets. There were teams from all over the world including Argentina, Australia, Brazil, Canada, England, France, Finland, Germany, Ireland, New Zealand, Scotland, Sweden and USA. Toronto Roller Derby was the hosting league and the whole event was handled beautifully by the league and their army of volunteers. No one had any idea how well it would be recieved, but attendance exceeded everyone’s expectations with over 2,000 people coming through the doors each day. Tags: Blood & Thunder Magazine, Brown Paper Tickets, Derby World Cup, Michelle Sunnyday, Tilted Thunder Railbirds, Toronto Roller Derby. So, whether you’re a fellow roller-girl or just need a little adrenaline-shot to get you ready to face the nine to five, this is the mix for you. Tags: AC/DC, Girl Talk, John Jett, L7, Lars Fredriksen and the Bastards, Michelle Sunnyday, Motorhead, Quiet Riot, Reverend Horton Heat, Rob Zombie, roller derby, Sweet, The Business, The Humpers, The White Stripes, Tilted Thunder Railbirds, Zeke.